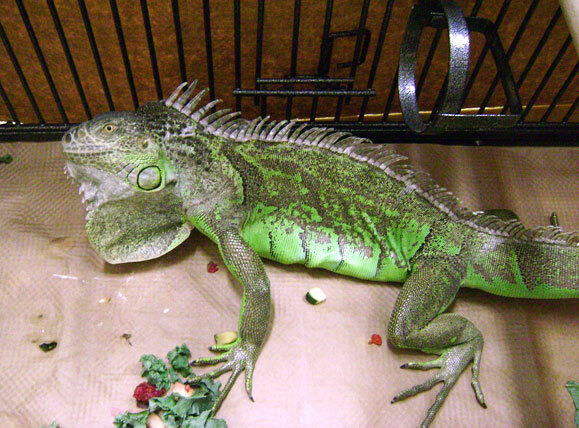 Spike is a 1 ½ year old green iguana who presented to our hospital with a decreased appetite and orange-colored urates. (Urates are the typically white portion of reptile eliminations.) He also had not defecated in 4-5 days. Spike was still very active at home and his owners fed him a good diet consisting of 70% dark, leafy greens. On physical exam, Spike was very bright and alert. “He” had a small head, small dewlap, and small femoral pores characteristic of female green iguanas. Spike’s abdomen was distended and several large masses were felt inside. We decided to take an xray of Spike’s body cavity. 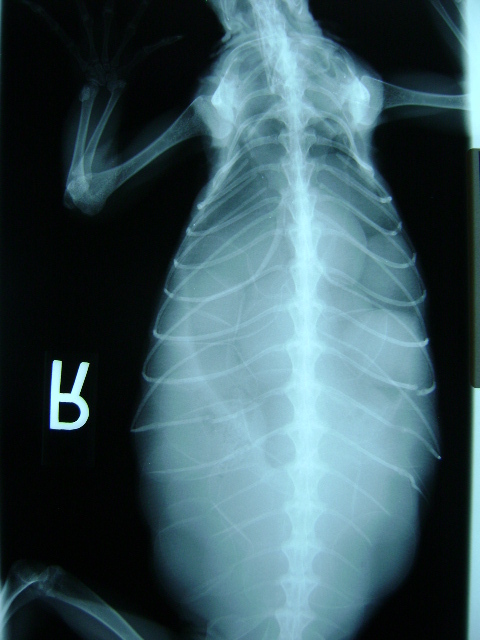 The xray confirmed that Spike was indeed a female, and she was full of eggs! 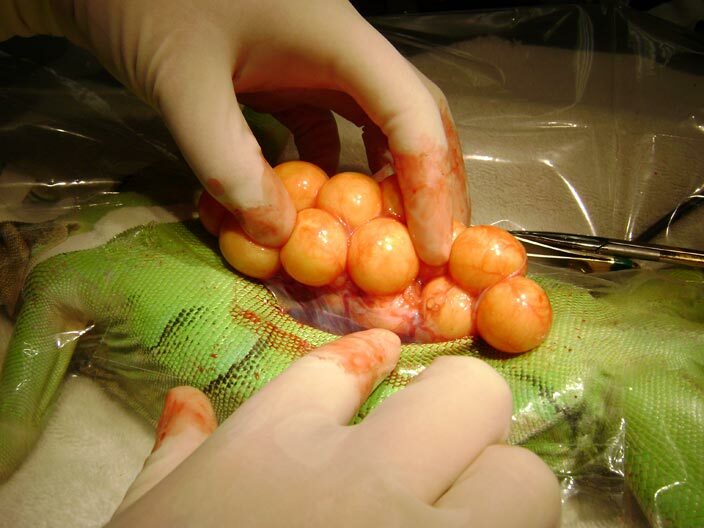 Female iguanas can produce a clutch of (infertile) eggs without the presence of a male. These eggs can be laid normally, but can also become stuck. Egg binding, or dystocia, is often difficult to differentiate from a normal pregnancy. Gravid (egg-carrying) females will often stop eating for a 3-4 week period but remain active. While this is considered normal, a quiet and depressed gravid female could indicate a problem. Spike was still very alert and active so we advised the owners to take her home, provide her with a nest site, and monitor her environment and health daily. There are many reasons why a normal pregnancy can progress to egg binding. 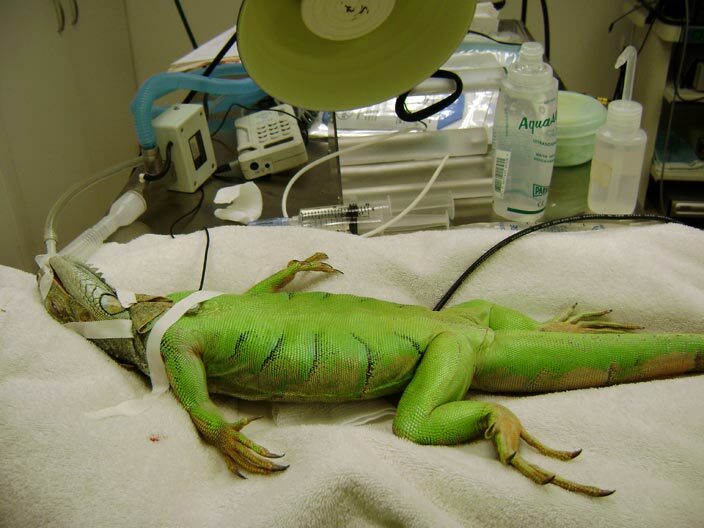 Some of the most common causes in captive iguanas are lack of proper diet, less than optimal environmental temperatures, handling stress, improper light sources, and inadequate nesting sites. After 10 days Spike was slightly less active and her appetite was decreasing. She had been digging in the nest, but no eggs were produced. The decision was made to surgically remove the eggs and Spike’s reproductive tract before she showed any further complications. The following photos are of the surgery. Spike recovered well from surgery. She quickly regained her appetite and activity. We expect that Spike will live a healthy, long life with no further reproductive problems.